NOTE: These decoders are obsolete. Most accessories and modifications mentioned on this page are no longer available. Never touch the copper tracks or ICs on your card when you insert it. If your body is charged with static electricity you will discharge it through the card into the decoder! The slot contacts are gold-plated but your pirate card contacts are covered with solder. Do not expect the connection to be reliable, ever again! PLEASE do NOT ask me about pirate cards or codes! I don't know anything about them. Pirate cards can damage your decoder by bending the contacts and by depositing solder on them! I do NOT repair D2Mac equipment or supply it, or cards, or software. 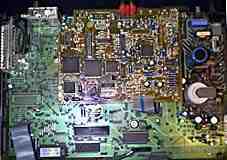 I DO supply some power supply repair kits for D2Mac decoders. People still write to me to ask "will my XYZ receiver work with an ABC decoder?" or "Why won't it work" or "What should I buy?" or "How should I connect it?". My answer is simply "I don't know." Some receivers are not designed to work with a D2Mac decoder. They might work with some models of decoder but not others. Some receivers have no Mac baseband output and will work only with a decoder which accepts PAL input. You should take your receiver to a satellite specialist and get him to provide a D2Mac decoder which is compatible. Be sure to ask for a demonstration of the decoder with your own receiver. Be sure to buy the same connecting lead and the decoder which are actually used in the demonstration. Bear in mind that a smart card may not be available for the programmes you want to watch. Ask your dealer about this. Make sure that the smart card is compatible with the decoder. If it's a pirate card then it may not be. If you have a Pace receiver then you would be wise to buy a Pace D2Mac decoder. If you have a Nokia receiver then buy a Nokia decoder. They are designed to be compatible. If you buy anything else, you are taking a gamble. Also, if things don't work, the receiver manufacturer will blame the decoder and vice-versa! You have effectively NO guarantee if the seller can show that the receiver works and the decoder works, unless you have it in writing that you bought them as a matched pair. The connecting cable can give problems. It should be short - preferably no more than half a metre. It should have no more wires than you actually need. (Some receivers use Scart pins 10, 12 and 14 for data connection). The video wires should themselves be screened (=shielded). Check in the FAQ for your receiver to see if special leads are required. (Amstrad and Nokia in particular). What sort should you buy? One that works of course. It's impossible to guess. As a general rule, do not use one more than 60cm long. Do not use one in which the video leads are unscreened. Gold plating is a waste of money unless your *socket contacts* are also gold plated. >not your speciality but do you have any pointers please? The symptom you describe suggests to me that the BSB receiver has not properly been converted to a D2Mac decoder. A very common problem! >hand side of the screen. >be central but then would be slightly too wide (I can live with that !). >Disconnecting 19 : no effect. >Disconnecting 16 : picture better position, but still not correct. >Do you have any thoughts how I can get the image to move to the right >? >Thanks for any help you can give. For RGB it's common to use the composite video for its sync connection, but the composite signal has been through RGB-PAL encoding. This takes time and results in the composite signal been out of phase with the RGB signals. This gives the picture shifted problem. Actually I do know how to cure it - buy a new Sony TV, you must have noticed all the Sky digital demos use Sony TVs - the picture on these is correct! >does not see it. I can't see any bad joints or dry joints. Any ideas? You don't give me any clues here. What do you see on the screen when you turn off the Blue Screen "No Signal" message by pressing "F" then "Store" ??? Do you get a picture when you simply route the signal out of the Pace decoder Scart and back in again with a piece of wire? Has the decoder *ever* worked with this particular receiver? Does the decoder work with any other receiver? Is the decoder *compatible* with the MSS1000? Is the Scart lead the correct type and short enough, screened/unscreened? Have you set the menu options correctly both on the MSS1000 *and* the decoder? Do you see a stable but scrambled D2Mac "picture" without the decoder? >dish, fully wired scarts, Sony TV and Grundig universal LNB. >please explain these more thoroughly. >I know you say use a Nokia D2Mac decoder but I can't buy one. >What do you think of Optimac or Macab 400? for use with Nokia? I know enough to be able to say with reasonable confidence that your problems stem from a mismatch between the SAT1800 and the CTU916 cable box. The only real answer is the one given (above) which is to test the receiver and decoder working together before you part with cash. I think that the Optimac and Macab are both made by RSD Communications in Scotland. This is a highly reputable company and should be able to tell you about any compatibility problems. If they can't then don't buy! I'm really sorry that I can't be more helpful but this is inevitably the problem with this sort of "mix & match" situation. >I have a question,can you help please? >I ask this because from all the sites I have been to none say if this is possible. I guess this is a bit like asking "is my honda 90 motorcycle compatible with my JCB excavator?" The question simply makes no sense, which is why no web site would mention it. A Digital receiver is designed to receive and reconstitute the digital transmissions sent in a special format called "MPEG" which refers to a method of squeezing many programmes into a single channel or "bouquet". An analogue receiver is designed to receive analogue transmissions in which each programme uses its own individual channel. Each channel is in a format which allows the original sound and picture to be transmitted and reformed for the TV set. Several formats are in current usage. In the UK and Europe we tend to use PAL (or SECAM in France which is similar apart from the way that colours are handled). In America the old standard is NTSC and in Scandinavia it is generally D2Mac. You need an analogue receiver which is compatible with the standard that you want to receive. In most cases it is possible to add an external box to receive a different standard. So, for example, a Frenchman wanting to get colour from UK transmissions with his SECAM receiver could plug a PAL transcoder into it, provided the two were compatible. Similarly, an Englishman wanting to watch a D2Mac transmission with his PAL receiver could plug a D2Mac decoder into it. However it is impossible for a digital receiver to make any sense of an analogue transmission, any more than a DVD disc player could play a 78rpm Long Play record! >have bothered asking you if I had known you were such a F***ING C*NT!!!!! "I object to the swear words used in the following reply from Mr King after I spent 20 minutes typing him an informative and amusing technical answer to his question. My children use this computer and I don't want them to read filth like this. I answer between 30 and 50 questions a day from people who really want the information and appreciate the humour. Thankfully, sad, stupid people like Mr King are very rare." >receive D2Mac signals through the Churchill. >so as to retain the Dolby surround sound. >checked and it is receiving a really strong signal. >decoder that is at fault? >back to the old setup, the problem is still there. months to determine the cause. What was it? or MAC input requirement and are specially wired at the Churchill end. Digibox entirely and replacing the original connections as they were. that you take it to a specialist shop and pay them to test it. >yesterday, and more importantly thank you for solving the problem. >It was as you suggested the scart lead that was the cause. >he assured me that it would not be the cause - it just shows what he knows. >Anyhow thank you once again. Churchill Multimac D2Mac decoder manufactured by Alfaglade Electronics near Manchester.